Of all the classes of meteorites I have photographed, the one with the most out-of-this-world features is the CV class of meteorites. Every time I look at one in thin section I am just stunned at how exotic the material appears. But, in close second I would say is the CO class of meteorites. And the Moss meteorite is a perfect example. 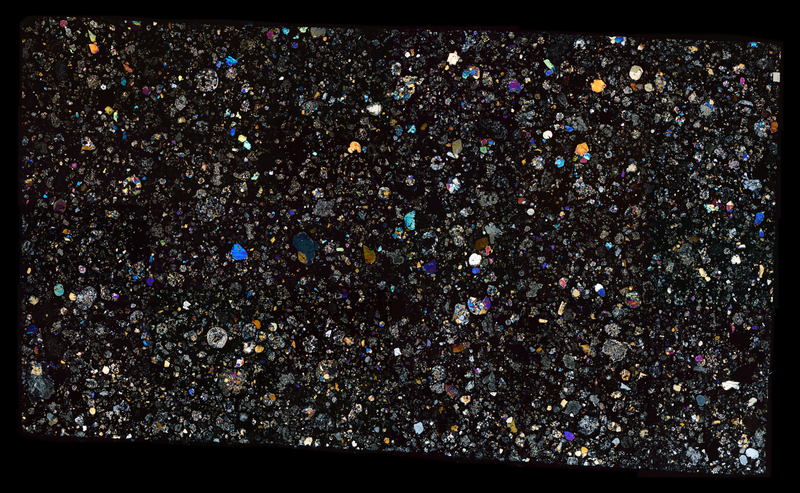 The thin section appears to have a wonderful intricate structure, with tiny inclusions and CAIs scattered among a bizarre black matrix. On second thought I may come back to this slide for a panoramic plane visible light image. There is a STRESS (Spatio temporal retinex-like envelope stochastic sampling gray-scale from GIMP) album in the gallery which I think shows many features that are faint and appear blacked-out by the matrix. The STRESS method has been used in astrophotography papers to reveal details hidden to the human eye in typical image files and I think it can be helpful here too.